Did Sam Rothstein manage any other casinos besides Tangiers? shown here during the 1970's. Did teamsters really fund the Tangiers? Did security really crush the hands of a cheater? Did Sam and Ginger have a daughter like in the movie? The Casino movie true story reveals that Sam and Ginger Rothstein’s real life counterparts, Frank and Geraldine Rosenthal, had a daughter named Stephanie and a son name Steven. Geraldine also had a daughter from a previous relationship with her high school love, Lenny Marmor (James Woods’ character in the movie). Robin Marmor was born on December 27, 1957, and was eleven years old when her mother met Frank. She was not depicted in the movie. Were the lion performers Sam hired to work at the Tangiers based on Siegfried and Roy? Indeed they were. When Siegfried and Roy’s contract was about to expire with a competing casino, Mr. Rosenthal (Sam) hired them to perform at the Stardust. Part of the agreement was a significantly higher salary, custom dressing room and space for their animals. “Lido de Paris Starring Siegfried and Roy” was born and so was a friendship that lasted a lifetime. Did Nicky really get banned from every casino in Vegas? Yes. In December 1979, Tony Spilotro, the real life Nicky Santoro, was blacklisted by the Nevada Gaming Commission, preventing him from entering any casino. Did the real Nicky Santoro have a son? Did Nicky really recruit his brother and other guys from back home to commit heists? Yes. The pack was referred to as “The Hole in the Wall Gang” because they cut holes in walls and ceilings to enter their target locations. Included in this group were his brother, Michael Spilotro, Herbert “Fat Herbie” Blitzstein, Wayne Metecki, Samuel Cusumano, Joseph Cusumano, Ernesto "Ernie" Davino, "Crazy Larry" Neumann, Salvatore "Sonny" Romano, Leonardo "Leo" Guardino, Joseph Blasko and their leader, Frank Cullotta. Frank Cullotta is portrayed in the movie Casino by actor Frank Vincent, as Nicky Santoro's sidekick Frankie Marino. Did they really put a rival’s head in a vise after he shot up a bar? 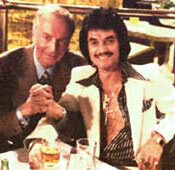 Frank Cullotta (right) in Casino. Did Nicky Santoro sleep with Sam Rothstein’s wife? Was Phillip Green’s business partner, Anna Scott, murdered in her home? Buy the Book - Now Back in Print! It's back! Nicholas Pileggi's true-to-life crime story that was the basis for the Martin Scorsese movie Casino returned to print in 2011. Get it in paperback. Was there really a Gaming Control Board investigation into Sam’s attempt to get a gaming license? Did FBI agents run out of gas and land their plane on a fairway? Did the real Sam “Ace” Rothstein have his own TV show? Sinatra's first time on a talk show. Yes he did. 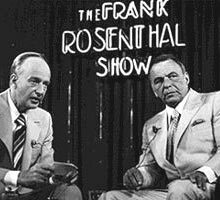 The Frank Rosenthal Show was taped at the Stardust and brought in many big name guests, including Frank Sinatra, Bob Hope, Wayne Newton, Liberace and O.J. Simpson. For those of you who are curious, he claims to have never juggled on the show. Was Sam the best handicapper in America? According to Sports Illustrated, Frank Rosenthal is “one of the greatest living experts on sports gambling”. -Sports Illustrated article "The Biggest Game in Town"
Is Sam responsible for putting sports betting into casinos? Did Sam and Ginger really get divorced? Yes. According to Frank, the real story is that he filed for the divorce and for full custody of their children. Geri did not contest it. Their divorce was finalized on January 16, 1981. Did Ginger really try to run off with their daughter and Lester? According to Frank Rosenthal (the real Sam Rothstein), his wife and her ex-boyfriend, Lenny Marmor, ran off with his daughter, his son and his money. In the movie, Lenny Marmor is the Lester Diamond character portrayed by James Woods. Did Artie Piscano die of a heart attack when the FBI found mob records in his home? Did Sam survive a car bomb assassination attempt? Why did Sam’s car have a metal plate under the driver’s seat? The 1981 Cadillac Eldorado had a balancing problem that was affecting the car’s handling. GM installed the metal plate under the driver’s seat to correct the problem. Did Ginger end up with low lives and drug dealers in Los Angeles? Yes. The true story behind Geri Rosenthal (Ginger in the movie) reveals that her interaction with these people ultimately led to her untimely death. On November 9, 1982, at the age of 46, she died in an LA motel from a drug overdose of valium, cocaine and whiskey. She is buried in Mount Sinai Cemetery in Los Angeles. 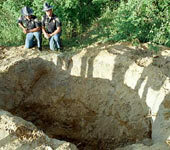 Were Nicky Santoro and his brother, Dominick, really killed? Yes, the real life Spilotro brothers were beaten to death but not in a cornfield as portrayed in the movie. According to Nicholas Calabrese, a former mob hitman that testified in the Operation Family Secrets trial, the brothers were told they were being promoted in the mob. Anthony Spilotro was to become a “capo” and his brother, Michael, was to become a “made member”. They were driven to a mob home in Bensenville, Illinois and were beaten to death in the basement. They were later transported to the cornfield in Enos, Indiana. Is the real Sam still alive? Did Sam insist on having an equal number of blueberries in each muffin? Watch video featuring interviews with Frank Rosenthal, the real Sam Rothstein, portrayed by Robert De Niro in the movie. Also, see footage of Tony Spilotro, the real Nicky Santoro (Joe Pesci).